Located just off the Centre Department of the Artibonite River in Haiti is the Péligre Dam which is a hydroelectric dam. 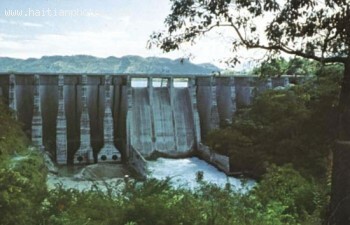 This dam is a feature of both Haiti and the Dominican Republic. It is the largest dam on the island of Hispaniola and was created in the 1930's as part of the valley Agriculture Project to control flooding and provide energy assistance in the Artibonite River Valley. In 1956 the dam was completed creating the Lake Péligre with the hydroelectric portion being completed in 1971. The plant is capable of providing the country with most of its electricity. Unfortunately, the dam is becoming run down without much needed repairs taking place. As such, it is offering less electric energy to the people of Haiti. The first two turbines became operational in 1971 with a capacity of 18 megawatts, but just four years later a third turbine was built which boosted the energy supplied up to 54 megawatts with capabilities of keeping power throughout the capital on a 24 hour basis. As of 2008 the capacity was 173 megawatts but more currently the energy capacity is 30 megawatts during the rainy season and 10 in dry season. Sediments that run off the hills surrounding the lake are reducing the size of Lake Péligre by half which has caused a major decrease in the dam's power. Since the dam is no longer being maintained, the fate of the hydroelectric turbines is now left up to nature. Heavy rains sometimes flood nearby villages often requiring the dam to be open.